Click Here To See Spider-Man #94 Comic Book! Check out this very nice 1998 Spider-Man cover, which was penciled by the great John Romita, Jr. and inked by the great Scott Hanna, from the story titled: "Who Was Joey Z?" 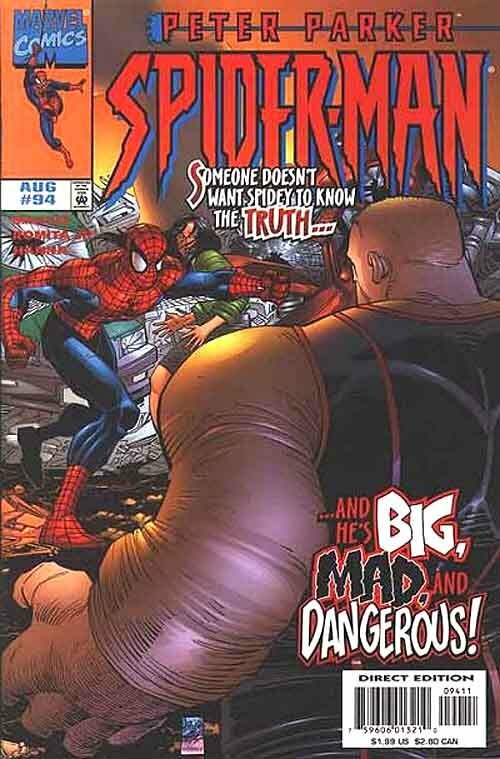 Spider-Man deals with THE OX (From The ENFORCERS) on this great cover from 1998. Over 50+ years into the publishing history of Amazing Spider-Man there are dozens of artists who've worked on the iconic title. However, the three that rise to top of the heap are co-creator Steve Ditko, his immediate successor John Romita and Romita's son John Romita Jr.! For almost 40 years now, Romita Jr. has been an important contributor to the industry with much of his best work taking place in the wall-crawler's world. JR JR's association with Spider-Man reaches all of the way from his first work on Amazing Spider-Man Annual #11 way back in 1977, at age 21 to well into the 21st Century. John Romita Jr actually received his VERY first credit in an even earlier issue of Amazing Spider-Man, when at the age of 13, he suggested the idea for the "Prowler" to his famous father in ASM #78! 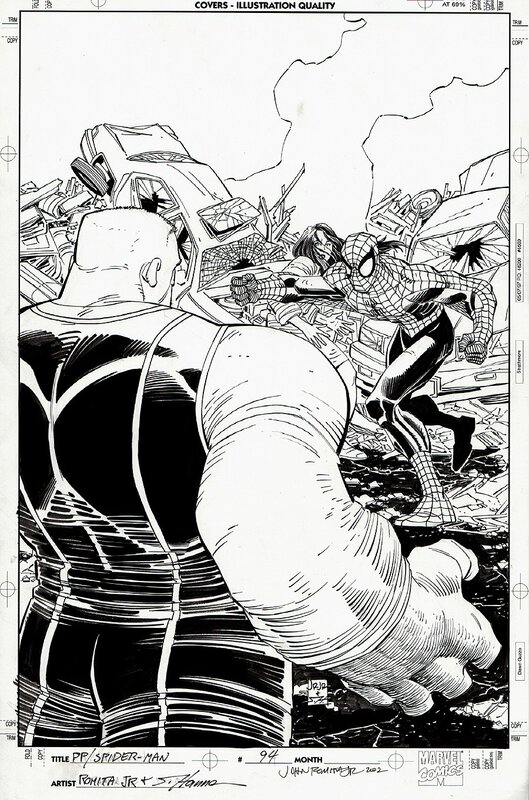 This is a great chance to own a stellar Spider-Man cover from one of the best Spider-Man artists ever! Compare this nice cover art to the published comic book in the red link above, as they flipped the cover for production purposes! ALL art on our website (including this one) are able to be purchased with VERY fair time payments, and trades are always considered towards "ANY" art on our website! Just send us an email to mikeburkey@aol.com and we can try to work something out.